Made by Wilkinson, Michael in Australia, Oceania, 2000. The Kylie Showgirl costume was designed by Michael Wilkinson and manufactured in the Ceremonies Costume Workshop. 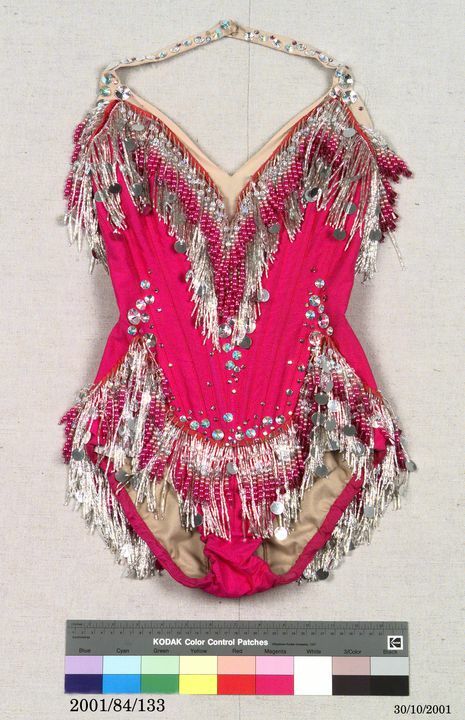 The costume features a pink silk beaded showgirl corset and diamante headdress. The costume featured in the Icons segment of the Sydney 2000 Olympic Games Closing Ceremony. It was worn by Kylie Minogue. Costume, "Showgirl" style worn by Kylie Minogue at the closing ceremony of the Sydney 2000 Olympic Games. The costume comprises an elaborate feathered headdress, and a pink, beaded body corset in a "showgirl" style. The body corset is made in hot pink shot silk, and features a halter neck and boned bodice with beaded tassels across the hip-line. Imitation crystals are attached to the neckline, bodice and pant section. The elaborate headdress consists of a tiara supporting three pink ostrich feathers above the crown. The front of the tiara includes15 prongs extending upwards in a lyrebird design, and three prongs curving downwards along either side of the jaw- line. The piece attaches to the head with three combs and an elastic strap. There is also a chrome mannequin with this costume. The mannequin was specially constructed to Ms Minogue's measurements to display the costume at the OCA's exhibition of the costumes at Homebush Bay in January 2001. Michael Wilkinson studied architecture at University of Sydney before completing the NIDA design course in 1993. Since graduating, Michael has worked as a designer right across the United States, Australia and New Zealand. His film credits include costume designer for the feature films Party Monster, American Splendor, Large,s Ark, In Gods Hands, Just Another Story, Milwaukee, Minnesota, Looking For Alibrandi, When Strangers Appear and True Love and Chaos. He was also design assistant on the feature films The Matrix, Far From Heaven and Moulin Rouge. His theatre work includes award-winning costume designs for the Sydney Theatre Company, Opera Australia, the Australian Dance Theatre, Belvoir St Theatre, the Bell Shakespeare Company, Steel City (at Radio City Hall) and the Ensemble Theatre. Michael also works as a stylist, with clients including Danny Glover, Kirstie Ally, Elle McPherson and Kylie Minogue. In 1999 he was awarded the Mike Walsh Fellowship and used this to further his international career in the USA and Europe. As of 2002 he is based in New York. The costume was co-designed by Jennifer Irwin. Born in Sydney in 1958, she has designed costumes for numerous Australian dance and theatre productions. Her designs for dance have been seen on stage in 24 countries. She has designed costumes for over 25 works by the Sydney Dance Company and has worked extensively with director and choreographer Stephen Page on his productions for the Bangarra Dance Theatre and for the Australian Ballet. Also with Stephen Page, Irwin designed costumes for the Opening Ceremony for the Festival of the Dreaming (1998) and for Tubowgule - the Opening Ceremony for the Sydney 2000 Olympic Arts Festival. Irwin also designed the costumes for the Official Ceremony for the Centenary of Federation on 1 January 2001. Jennifer Irwin's many costume design commissions for dramatic works include collaborations with directors Gale Edwards and Marion Potts for the Sydney Theatre Company and with Neil Armfield for Company B at the Belvoir St Theatre. She was awarded a Theatre Board (Australia Council) grant to study scenic design at La Scala Opera in Milan, Italy. Her designs for the Closing Ceremony demonstrate her unique talent of infusing contemporary, cutting edge design with a sensitivity and understanding of dance, movement and cultural significance. The design of the 'Kylie Showgirl' costume was developed to resonate with the media image of Kylie as seen in her 1998 'Intimate and Live' international tour. The costume is in her signature colour, pink. Maker name Corset: Julie Bryant of the Ceremonies Costume Workshop. Headdress: Peter Lang, Alexandria.